The Bahamas is a nation in the Atlantic Ocean, made up by 29 islands, 661 cays, and 2,387 islets. The Bahamas' capital is Nassau and other cities are Freeport, Matthew Town and Alice Town Bimini. The Travellers Guide has a selection of 3 star, 4 star and 5 star hotels, guest houses and bed & breakfast accommodation on the Bahamas, listed below. 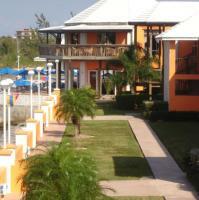 Please view our hotel offers page for the latest special offers for a range of hotels on the Bahamas. The most popular festival on the Bahamas is Junkanoo, which is celebrated on December 26 and January 1. Nassau offers one of three big airports (Lynden Pindling International Airport (NAS)), while smaller airports can be found all over the Bahamas. Each year, the Bahamas attracts a multitude of tourists, who love the destination for its wonderful sandy beaches and the tropical climate. Water sports are also very popular on the Bahamas. This oceanfront property is located in Great Guana Cay on the beach. Each cottage provides a fully equipped kitchen and the property offers bicycle rentals and an outdoor pool. Nestled within a corner of Grand Bahama Island, this Freeport resort offers access to a white sand beach and provides equipment for a variety of indoor and outdoor activities.